This modern, private-enterprise economy has capitalized on its central geographic location, highly developed transport network, and diversified industrial and commercial base. Industry is concentrated mainly in the populous Flemish area in the north. With few natural resources, Belgium must import substantial quantities of raw materials and export a large volume of manufactures, making its economy unusually dependent on the state of world markets. Roughly three-quarters of its trade is with other EU countries. Public debt is more than 85% of GDP. On the positive side, the government has succeeded in balancing its budget, and income distribution is relatively equal. 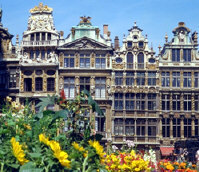 Belgium began circulating the euro currency in January 2002. Economic growth in 2001-03 dropped sharply because of the global economic slowdown, with moderate recovery in 2004-07. Economic growth and foreign direct investment are expected to slow down in 2008, due to credit tightening, falling consumer and business confidence, and above average inflation. However, with the successful negotiation of the 2008 budget and devolution of power within the government, political tensions seem to be easing and could lead to an improvement in the economic outlook for 2008.